This is one point I would like to stop and expand on. Getting a great job isn’t just about what you know, it is about what you can provide. As IT and business grow closer and closer together there is a strong need for customer service (see my article about that there). It is no longer enough to be technically savvy, but we also must be business savvy. Being a great fit for a role means you bring in the enthusiasm for what you do and you have potential to grow in your role and grow the business; this even more essential at a for-profit company. It’s sometimes hard to be passionate about a job, but you can be passionate about what you like to do and express that. 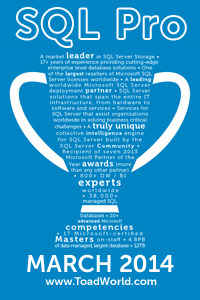 If you like Databases, be passionate about it. If you like Project Management, be passionate about it. If you like development, quit your job and become a DBA; I’m just kidding, be passionate about that too. This has been one of the things that has carried me over the last year. There are always challenges at work, and sometimes it almost feels like you are climbing Mount Everest. That’s the beauty of it though, what good is a job that is boring? My first assignment with Microsoft was to convert a BI System from Cognos & Oracle to the Microsoft Data and BI Platform. It was a challenge for sure! Although I had used Analysis services before, I had never done it at the enterprise level and I had never used the Tabular model from SSAS. It’s a hard pill to swallow when you have to tell your manager that what he’s asking you to do is over your head and the timeline is very tight to get it done. It was a difficult conversation with me, but I had it early on with my manager after I tried to learn the technology. As a new employee I had a lot of learning and catching up to do. He understood that and he supported and encouraged me. It was a huge feat, but it got done, and it got done in a way that the road was paved for others to follow in my footsteps. It’s possible to beat the challenge if you are determined. Now I’m not Superman (just Ayman, so a different kind of man) and so I proudly admit that I had a lot of support from my peers in the Microsoft community. It takes a lot of pride swallowing to admit you don’t know something but I feel the sooner you admit it, the sooner you can get over yourself and start really learning and excelling. There is no one that knows everything and there is no one that has not relied on someone else to teach him/her something. Humility never puts you down, rather it raises you and makes you realize your own gaps and your potential. Never look at a deficit in knowledge or experience as an anchor that pulls you down, rather look at it as an opportunity to learn and grow. Being overwhelmed is a natural effect of the demanding world we live in where data continues to grow at an exponential rate and technology is getting more and more advanced by the minute. “Drinking from the firehose” is a phrase that everyone uses at Microsoft. It’s a reality that I live almost every day even one year in. It can be a hamper to progress sometimes when you feel like you want to throw your hands up and say “turn it off” hoping that you can cach your breath. There is no way to eliminate stress completely, but there is a way to handle it in a way that doesn’t drive you crazy. One of the best techniques that I used is to get a separate phone for my work where my work email and phone calls are forwarded to. You never stop aging, work never stops going, and I cannot stress enough how important it is to build and strengthen relationships with friends and family. It helps keep you human, it helps keep you sane! Saying no is hard sometimes, but I’ve learned that it is a necessity to stay sane. There needs to be some boundaries that you set with your managers and peers about your time, even if it means blocking off non-work hours on your calendar. Now, I did work weekends and days off this year, but I did it because I had some bandwidth and I did it because I had a team that was flexible and supportive and believed in me. That kind of motivation pushed me to put in extra effort at critical times. When these times went, I played as hard as I worked and that helped me bounce back. I think people misunderstand that working hard means working more than 40 hours a week because the reality is when you’re tired and stressed you perform worse and you produce less. Another aspect of this year that I wanted to reflect on was something I called “the non-changing self” or better known as integrity. So this goes two ways, let me explain further. Many people when they join a well-known company like Microsoft one of two things (or both) happen: 1. They get arrogant and start looking down on people 2. People who used to look down on you (or not give you the time of day) all of a sudden look up to you. The latter cannot be controlled, but it doesn’t mean that you fall for it. I am a believer that my blue badge doesn’t define who I am and never will. Microsoft is where I work, it is not who I am. I’m passionate and blessed to work here, but that doesn’t mean I am better than anyone else who is outside the organization. The heights I’ve reached have been by relying on the help of others, the same help the pulls me up when I fall down and help me get back on my feet. That’s how I view the world, a world of people who have integrity and look beyond labels to value others. From that last thought, I’d like to tangent into the value of mentoring. When I first started at Microsoft I had two mentors that were selected for me and I third informal mentor that I had reached out to. It’s a great practice that they do and extremely beneficial. I highly recommend everyone to find a mentor and be a mentor. The value of listening and conversing with someone that has similar career (and sometimes life) goals is refreshing. It adds that human element to work that we are missing; also known as building positive relationships. It truly makes you feel like you are not alone out there and that there are others that have struggled just like you. Mentoring also gives you that experience from seasoned professionals that you cannot get from reading a book or attending a training session; that field experience in dealing with customers and customer problems. My mentors have been one of the most valuable contributions to my growth during my career at Microsoft and even before that. Mentoring completes the cycle of taking and then giving back to that large pool of knowledge and experience that helps us all grow. Finally I like to always take a look behind me and see the road that brought me where I am. It helps keep things in perspective and helps keep me as humble as I possibly can. There have been challenges and challengers to my career growth both on and off the job. They have been from a learning perspective and a cultural perspective. By cultural perspective I mean both the work culture and my own personal culture that I life and breath every day. It’s important to mention this here for me because I had a rough time starting out when I first started college in September of 2001 (less than two weeks after the World Trade Center tragedy). When I visited my family in Egypt during the winter break I almost gave up and stayed there. I hated the treatment I got, and I won’t elaborate more than that but you can guess what it would have been like with my ethnic and religious background and a first name of Ayman (hint hint). I’m not here to cry about it, what happened has happened and I learned and grew from there. No one can define who I am or judge me based on the actions of others, and I’m not saying that anyone has the right to do that but it is a fact of life. I’ve always seen these factors as hurdles that I need to jump over as opposed to walls blocking my way. That road I see behind me helps me appreciate all that I have and strive to help others be the best they can be. It’s a road that I can see my own mistakes on, things I try hard not to repeat and things I try to improve on. So I say to all those that struggle, keep pushing it will just make you stronger and don’t ever forget where you came from. Well I think that about wraps up an exciting year of challenges and opportunities. I hope in the near future I’ll be able to spend more time blogging problems/solutions that I have been encountering to help others learn more about Data and BI. I hope you all enjoy your summer and best wishes. It’s a very nice article and enjoyed it reading. Also it gave me some inspiration. Thank you.